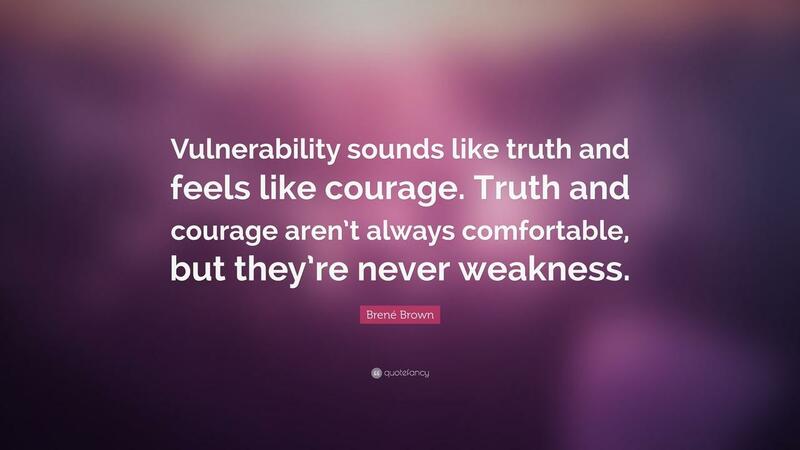 Reflecting on some conversations I have had the past couple of weeks with different business owners, the idea of 'leading with vulnerability' has re-entered my thoughts. As leaders we are required to be truly vulnerable, and we are all leaders. Read the quote above again. Read it slowly. Break it down. To the listener, our vulnerability builds trust, yet at the same time they feel the courage. Through that strength is grown. And to add to these thoughts, with strength comes respect and admiration. When we get out of our comfort zone by being vulnerable, we are actually not only adding to the relationship of who we are leading and coaching, we are also allowing ourselves to grow. Admitting things about ourselves is healing, and uplifting. It is scary, however it is a growth factor. You cannot grow if you do not get uncomfortable. When I was in my late twenties I was given the keys to a manufacturing plant to lead. I was technically sound, knew the business, and had a great grasp of the customer base. I had led many projects that were very successful. The plant was growing and going, as they say. We had a great team of people and the culture was in a pretty good place. I couldn't have had a better opportunity to learn to lead. Boy, did I make mistakes. While I had proven myself, I had not been a leader of people for long. I made some mistakes quickly. My personality type is a driver/ influencer (DISC profile). What that means is I am to the point and ambitious. It also means I need to...wait for it..."slow down to speed up." Have you ever heard that from me before? If not, you will. Why? Because I learned it the hard way. I almost completely alienated all the managers that had previously been my colleagues and that now reported to me. Why? Because I wasn't taking the time to communicate, encourage, and most importantly listen. Let me let you in on a secret, I still have to work on those things. It just isn't in my make up naturally. So I had to go to work and figure this leadership thing out. I went to seminars, read books, sought out mentors...etc. If it was something in the realm of leadership I researched it and studied it. And for the most part I still do to this day. What I ultimately learned, that allowed me to correct this situation, was being vulnerable. I quit trying to keep up the hype that I 'deserve' to be their leader. I stopped pretending to have it all together. I learned to just be my authentic self with imperfections and all. We met as a team and I confessed my insecurity with trying to be their perfect leader. I got real with them. We grew as a team, as friends and as a business. To this day I am very close to all of those people even though we live all over the world. We would stop in our tracks to help one another. I have to say, it wasn't all me that built that great team and friendships. It was all of us. However, as the leader figure I could have destroyed that potential by not allowing the greatness to happen. My fear and insecurity could have been placated by comfort, however I had mentors that helped me see I needed to take the accountable actions of stepping into my uncomfortable zone and grow. I thank God for those people, for the opportunity and for the path of personal development that put me on. I have been on that path for 26 years now. Still learning. My great lesson from this experience was that through being vulnerable and authentic, leadership rises. It gives space and comfort to those being led while being somewhat uncomfortable for the leader for the moment. Over time I became comfortable in being uncomfortable. When I made this change within myself, my true leadership shown through. The ability to just be my authentic self was freeing. I was able to be the driven influencer again, however with the full complement of a team. So if you see someone struggling with communicating, encouraging or listening, nudge them and remind them to "slow down to speed up". When one is working at a fast pace, it is even more difficult for them to be intentional about these things. Being a team is just this, helping each other be our best. Reminding each other to be vulnerable and open is so important. Go be vulnerable today with a colleague, client, fellow business owner or a family member. Witness the strength it builds in the relationship.